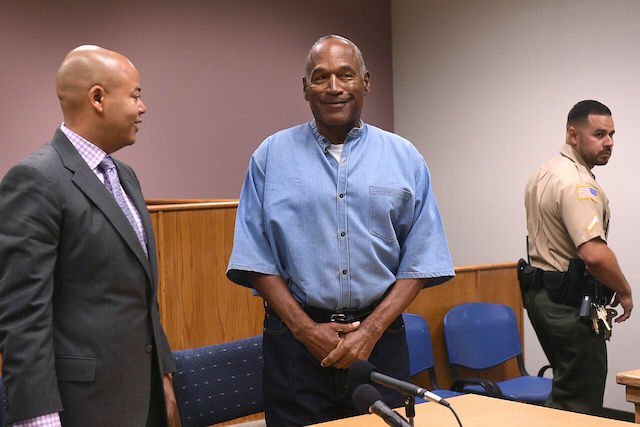 After serving nine years for a botched robbery and attempted kidnapping in Las Vegas, O.J. Simpson was released from a Nevada State prison early Sunday morning moments after he became eligible for parole, according to the Washington Post. "He is out," said spokesperson Brooke Keast, of the Nevada Department of Corrections, to the Los Angeles Times. "I do not know where he&apos;s going. I didn&apos;t want to know, to be honest"
Simpson departed the Lovelock Correctional Center at around 12:08 a.m. on Sunday morning with an unidentified driver, a mere eight minutes after he became eligible parole. "It was incident free, nobody followed, it was exactly what we&apos;d hoped we could do for public safety," Keast said to the L.A. Times. "It was a public safety concern. To make it quiet, under the radar and incident free." Where Simpson, now 70-years-old, is headed to next is hardly clear. His attorney told the Times only how Simpson is looking forward to being free from jail, and seeing his family. Though Simpson was originally handed a 33-year sentence, the Nevada State Parole board unanimously granted him parole back in July. Simpson reportedly earned credit for good behavior, and for taking classes in prison. Simpson was originally convicted of kidnapping and armed robbery, among other charges, for a failed 2007 sports memorabilia heist at the Palace Station Hotel and Casino in Las Vegas.